The transplant team met yesterday morning and it was decided the best plan would be for us to just stay here in the hospital until transplant. That way, Em can stay on the Milrinone, and keep feeling well and be strong for surgery. The doctors are happy with the balance of meds, and very happy with how well she feels. Since she is high on the list, the doctors are optimistic it could be soon, but there is really no way to know. Maybe only weeks to wait, not months. She is doing pretty well. Yesterday was supposed to be her first day of school with the tutor, which will be 2 hours a day. But, alas, as it was for many of you, it was a snow day at Queensbury, and consequently a snow day here. 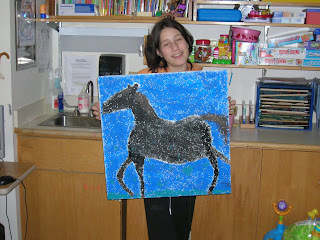 So instead, she made a painting of a horse on one of the ceiling tiles for the activity room. So perhaps today will start the tutoring. We are also high on the waiting list for a private room, which is unbelievably helpful in making this scene bearable. We've had three roommates the last three days, and the disruptions make rest very difficult. As a long-term patient we get higher priority for a single. They had a large number of transplants in January, and post-transplant patients all get private rooms. Some of them are going home and some rooms are opening up, according to our spies. Keep your fingers crossed. I love the black horse painting. Could it be a Friesian? Jerry and are thinking about you guys all the time. Good Luck. That should read Jerry and I are thinking aobut you guys all the time.